Pastry shelves here are filled with gorgeous swans of meringue and treats filled with cream cheese and guava jelly. 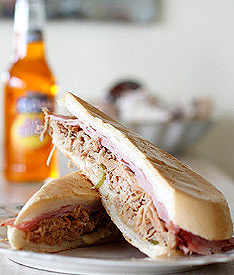 The bread for the sandwiches, such as the Cuban and the medianoche, is made fresh in-house. Don’t miss the ropa vieja—shredded beef stewed in garlic, onion, green and red peppers, wine, and tomato sauce. Wash it down with imported Goya coconut water or an authentic Cuban Ironbeer.